People born with the sign, Capricorns (Kumbha) and Aquarius (Makara), Taurus (Vrishabh) and Gemini (Mithun), are generally recommended to wear an Amethyst. 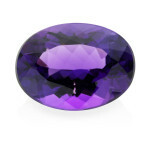 Amethyst as a healing stone that is known to calm and protect the mind. It soothes those who have engaged in constant rigorous mental activity.and has also been referred to as “nature’s tranquilizer” by many healers because of it’s effectiveness in relaxing not only the mind but also the nervous system. Amethyst is an excellent stone for meditation and for opening the third eye and increases your ability to open to new ideas and help open the channels to your higher self. For this reasons many suggest amethyst for those seeking spiritual growth. It is said to also have a relieving effect on stress, grief, depression, emotional despair and ineffective communication. 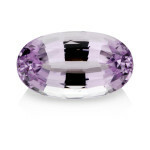 It is a beautiful violet-colored stone also known as a lover’s gem, signifying faithfulness and true love. It is known to change color when the wearer becomes ill. Wearing an Amethyst could well result in a sudden upturn in the wearer’s finances, luxuries, comforts and also in the love life. An Amethyst sometime is recommended as a substitute stone of “Blue Sapphire” to reduce the bad effects of the malefic position of Saturn (Shani) in the horoscope of a native. An Amethyst if worn by scientists, physicians, astrologers, research scholars and mathematicians shows great results as I is said to have the power to empower the concentration.